They asked each other, "Were not our hearts burning within us while he talked with us on the road and open the Scriptures to us?" What is Face to Face? An adaptation of the Walk to Emmaus, The Heart of Ohio Face to Face Encounter is specifically crafted to meet the needs and life-stages of older adults. The program seeks to invite men and women, ages 60 and older, to experience Jesus through a 4-session journey, covering subjects such as discipleship, mission, grief, and end-of-life issues. The highly flexible schedule allows participants the freedom to engage in structured Bible study and prayer in a church setting or other community space. 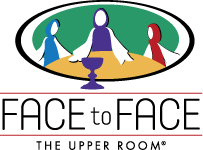 Led by clergy and lay leaders, Face to Face strengthens and renews followers of Christ and bolsters the spiritual life of individuals, families, and congregations everywhere. Face to Face is open to members of any Christian denomination who want to strengthen their spiritual lives, discover answers to their questions about faith, and are open to understanding the responsibility of living a Christian lifestyle. Face to Face allows the opportunity to rediscover Christ’s presence in your life, to gain fresh understanding of God’s transforming grace, and to form friendships that foster faith and support spiritual maturity. If you desire a deeper, more meaningful walk with the risen Christ, if you would like that relationship to be reflected in every other relationship in your life, if you wish to make a deeper impact on the world around you by living a life centered on Jesus Christ, then join us as we encounter the Risen Christ... Face to Face. What is the Face to Face Encounter Experience? • You will laugh, you may cry, and you will return home having experienced the love of Christ at a level you may never have previously experienced. • are open to dedicating their everyday life to God in an ongoing manner. Another intent of the Face to Face Encounter is to build strong Christian leaders for the home church. The church cannot exist with clergy alone; it takes a strong lay leadership to help effectively build the church into a Christ-loving, Christ-following fellowship. A person who attends a Face to Face Encounter with an open heart to the love of Christ can expect to return home as a stronger Christian leader. Is There a Time When I Should Not Consider Attending? If you have experienced a recent major life changing experience such as the loss of a loved one, a divorce, etc., you should consider postponing your Encounter until you have worked through your emotions from that event. For a Face to Face Encounter to be effective, the participant should be able to focus on the events of the weekend and not on events or activities back home. If you are unsure if you are ready to attend, perhaps you are not. Consult your pastor or another trusted Christian friend to determine if you are emotionally ready for the Encounter. Pray about it; God will tell you when you are ready. When Are Heart of Ohio Face to Face Encounters Scheduled? The Heart of Ohio Face to Face Community currently holds one Encounter per year, typically in late summer (beginning late July or early August for four weeks). The Encounter is held at a church within the Heart of Ohio Emmaus Community. We try to schedule our Encounters in communities that have the greatest number of Emmaus activity. In 2016, the Heart of Ohio Face to Face Encounter will be held in Ashland; the 2017 Encounter is currently scheduled to be held in Wooster. For further information about our upcoming Encounter, please visit our Community Calendar page. Are you interested in attending a Heart of Ohio Face to Face Encounter? We invite you to join in an exciting four days spent in meeting Jesus Christ as your friend who comes to you in God's love as expressed through other Christians. Come experience the love of Jesus Christ in a deeply enriching four-day Encounter! Download our Face to Face Application. If you are interested in attending a Face to Face Encounter but do not live in the Heart of Ohio area, visit the International Face to Face Home Page. Click on the "Finder and Maps" link on the page to locate an Emmaus/Face to Face community closer to your home. 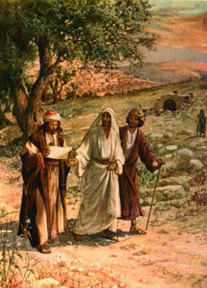 (13) Now that same day two of them were going to a village called Emmaus, about seven miles from Jerusalem. (14) They were talking with each other about everything that had happened. (15) As they walked and discussed these things with each other, Jesus himself came up and walked along with them; (16) but they were kept from recognizing him. (17) He asked them, "What are you discussing together as you walk along?" They stood still, their faces downcast. (18) One of them, named Cleopas, asked him, "Are you only a visitor to Jerusalem and do not know the things that have happened there in these days?" (19) "What things?" he asked. "About Jesus of Nazareth," they replied. "He was a prophet, powerful in word and deed before God and all the people. (20) The chief priests and our rulers handed him over to be sentenced to death, and them crucified him; (21) but we had hoped that he was the one who was going to redeem Israel. And what is more, it is the third day since all this took place. (22) In addition, some of our women amazed us. They came and told us that they had seen a vision of angels, who said he was alive. (24) Then some of our companions went to the tomb and found it just as the women had said, but him they did not see." (25) He said to them, "How foolish you are, and how slow of heart to believe all that the prophets have spoken! (26) Did not the Christ have to suffer these things and then enter his glory?" (27) And beginning with Moses and all the Prophets, he explained to them what was said in all the Scriptures concerning himself. (28) As they approached the village to which they were going, Jesus acted as if he were going farther. (29) But they urged him strongly, "Stay with us, for it is nearly evening; the day is almost over." So he went in to stay with them. (30) When he was at the table with them, he took bread, gave thanks, broke it and began to give it to them. (31) Then their eyes were opened and they recognized him, and he disappeared from their sight. (32) They asked each other, "Were not our hearts burning within us while he talked with us on the road and opened the Scriptures to us?" (33) They got up and returned at once to Jerusalem. There they found the Eleven and those with them, assembled together (34) and saying, "It is true! The Lord has risen and has appeared to Simon." (35) They the two told what had happened on the way, and how Jesus was recognized by them when he broke the bread. Need More Information About Face to Face?